What we’ve come to realize in the past month or so is that our vast history and elements of Supara’s universe isn’t something to take with a grain of salt. Ever since we started meeting regularly at our new space (big thanks to Frank), we’ve been primarily taking on one massive topic… and that would be “world building”. The thing is; we need to establish more than a short history lesson before continuing with our script. As well as balancing a core source material we can all pull from while leaving enough of it open to try not to box anyone in creatively. That’s always the crutch with developing an enormous universe with a group of other people. Everyone has their own idea of what it should be and we all have to figure out what seems like it fits and what doesn’t. Since we’re not getting paid and this isn’t a legitimate writer’s room with an actual show-runner… we find ways to work with each other. So instead of running with it and possibly changing the rules whenever we want to; we as creators want to know and understand how far with can push the limits without being overly or unrealistic even in the world of Supara. One of our major deciding factors (and this fits with developing our characters as well), is what translates better from panel to panel. “Yeah, that seems cool but how would that look?” If we can’t find a way without making it look too goofy or stilted; than its best that we try something else entirely. Trouble is as a writer, you have to distance yourself with everything that you develop regardless of how much time you’ve put into it because you may find out that it won’t be used and defending it only makes it worse. Much like writing for television. So how we go about developing our world is revisiting an already established history and applying it where it’s pertinent. Our comic universe (thus far) starts in 1948 but takes place in 2013 (excluding any origin stories predating ’48). Between those dates, people are different in some of the most basic ways but that can have a large impact on a society over a span of time. For example: The presence of Powers and their assistance increases funding for more science and exploratory projects. Better funding comes with better research and development, proving better results depending on the area, and then in turn the average American citizen is smarter. That’ll make technology even more prevalent and has advanced at least 30 to 40 years on us currently. Plus there is an alien spaceship. What did we just prove? Things are different and people aren’t as dumb. And that alone has an incredible effect on us. Smarter people means more ambitious people, the more ambitious they are and with the means create more sustainable and creative architecture, better medicines results in longer healthier lives, 3D movies become 4D… you get the picture. We focus on this because that means our city; Supara Valley is the epicenter of all things Power related. The differences I just mentioned would be most noticeable there. Your next question might be what that does mean for the story? So now based off our history, our artist knows the architecture is obviously newer and sleek without being futuristic. Artist also knows that transportation within downtown Supara is much cleaner and the use of elevated trains and other forms of public transportation are seen quite often. On the other hand, our writers (like me) know that their dialogue is going to be a more flippant and educated because that’s what their society lends itself to. We all know that they are enormously easier ways to get all of this across the reader without saying too much and we don’t plan on spelling it out. The point is that as indie comic creators; there isn’t a realistic conceivable way to put out multiple books a month to remain successful the way normal comics can. The books we eventually get out will hold a sense a familiarity, a consistent voice, and quality we’ll hopefully be proud of. If the story isn’t worth being told then we wouldn’t tell it. Every panel is going to matter in some respect and that’s what we’re trying to deliver. Then that’s where we begin dividing up the elements between us, using our strengths for writing, drawing, and producing. Some will draw up buildings, others will write up stories to that building. Some we deliver characters with abilities and look while someone writes up their origin and premise. Then we bring all those things to the table and refine them before finally filing them away or sending them off to Michael Mayne for early character conception. We’re now to a point where it’s a well oiled machine. The world building will never end and it shouldn’t have to. I like to believe the reason why we’re so gung-ho about just this part of our universe… is that the most important character out of all of our characters is quite obvious and her name is in the title… “Supara”. That’s it for now. 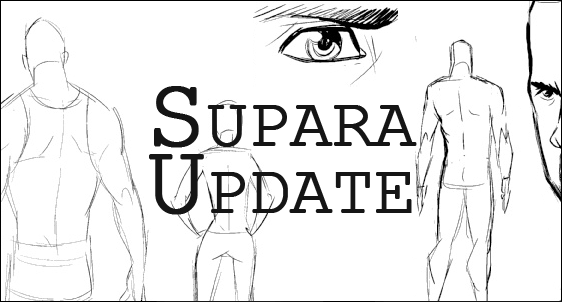 We’ll hopefully start posting up new Supara Updates on a regular bi-weekly basis so stay tuned and thanks for reading.